.001 µF C-TD001-630 Diameter 0.21 in. .001 µF C-TD001-630 Item Length 0.55 in. .001 µF C-TD001-630 Packaging Dimensions 3.8 in. x 0.2 in. x 0.2 in. .001 µF C-TD001-630 Weight 0.001 lbs. .0022 µF C-TD0022-630 Diameter 0.27 in. .0022 µF C-TD0022-630 Item Length 0.56 in. .0022 µF C-TD0022-630 Packaging Dimensions 3.8 in. x 0.3 in. x 0.3 in. .0022 µF C-TD0022-630 Weight 0.002 lbs. .0033 µF C-TD0033-630 Diameter 0.22 in. .0033 µF C-TD0033-630 Item Length 0.56 in. .0033 µF C-TD0033-630 Packaging Dimensions 0.56 in. x 0.56 in. x 0.214 in. .0033 µF C-TD0033-630 Weight 0.001 lbs. .0047 µF C-TD0047-630 Diameter 0.18 in. .0047 µF C-TD0047-630 Item Length 0.56 in. .0047 µF C-TD0047-630 Packaging Dimensions 3.8 in. x 0.2 in. x 0.2 in. .0047 µF C-TD0047-630 Weight 0.001 lbs. .0068 µF C-TD0068-630 Diameter 0.21 in. .0068 µF C-TD0068-630 Item Length 0.56 in. .0068 µF C-TD0068-630 Packaging Dimensions 3.8 in. x 0.3 in. x 0.3 in. .0068 µF C-TD0068-630 Weight 0.001 lbs. .01 µF C-TD01-630 Diameter 0.21 in. .01 µF C-TD01-630 Item Length 0.56 in. .01 µF C-TD01-630 Packaging Dimensions 3.8 in. x 0.2 in. x 0.2 in. .01 µF C-TD01-630 Weight 0.001 lbs. .015 µF C-TD015-630 Diameter 0.23 in. .015 µF C-TD015-630 Item Length 0.55 in. .015 µF C-TD015-630 Packaging Dimensions 3.8 in. x 0.3 in. x 0.3 in. .015 µF C-TD015-630 Weight 0.002 lbs. .022 µF C-TD022-630 Diameter 0.27 in. .022 µF C-TD022-630 Item Length 0.55 in. .022 µF C-TD022-630 Packaging Dimensions 3.8 in. x 0.3 in. x 0.3 in. .022 µF C-TD022-630 Weight 0.002 lbs. .033 µF C-TD033-630 Diameter 0.3 in. .033 µF C-TD033-630 Item Length 0.55 in. .033 µF C-TD033-630 Packaging Dimensions 3.8 in. x 0.3 in. x 0.3 in. .033 µF C-TD033-630 Weight 0.002 lbs. .047 µF C-TD047-630 Diameter 0.27 in. .047 µF C-TD047-630 Item Length 0.7 in. .047 µF C-TD047-630 Packaging Dimensions 0.56 in. x 0.56 in. x 0.214 in. .047 µF C-TD047-630 Weight 0.003 lbs. .068 µF C-TD068-630 Diameter 0.31 in. .068 µF C-TD068-630 Item Length 0.71 in. .068 µF C-TD068-630 Packaging Dimensions 4 in. x 0.3 in. x 0.3 in. .068 µF C-TD068-630 Weight 0.003 lbs. .1 µF C-TD1-630 Diameter 0.31 in. .1 µF C-TD1-630 Item Length 0.94 in. .1 µF C-TD1-630 Packaging Dimensions 4 in. x 0.4 in. x 0.4 in. .1 µF C-TD1-630 Weight 0.005 lbs. .15 µF C-TD15-630 Diameter 0.38 in. .15 µF C-TD15-630 Item Length 0.95 in. .15 µF C-TD15-630 Packaging Dimensions 4.5 in. x 0.4 in. x 0.4 in. .15 µF C-TD15-630 Weight 0.006 lbs. .22 µF C-TD22-630 Diameter 0.45 in. .22 µF C-TD22-630 Item Length 0.95 in. .22 µF C-TD22-630 Packaging Dimensions 4 in. x 0.5 in. x 0.5 in. .22 µF C-TD22-630 Weight 0.008 lbs. .33 µF C-TD33-630 Diameter 0.45 in. .33 µF C-TD33-630 Item Length 1.19 in. .33 µF C-TD33-630 Packaging Dimensions 4.8 in. x 0.5 in. x 0.5 in. .33 µF C-TD33-630 Weight 0.01 lbs. .47 µF C-TD47-630 Diameter 0.54 in. .47 µF C-TD47-630 Item Length 1.19 in. .47 µF C-TD47-630 Packaging Dimensions 4.5 in. x 0.5 in. x 0.5 in. .47 µF C-TD47-630 Weight 0.012 lbs. .68 µF C-TD68-630 Diameter 0.64 in. .68 µF C-TD68-630 Item Length 1.18 in. .68 µF C-TD68-630 Packaging Dimensions 4.5 in. x 0.6 in. x 0.6 in. .68 µF C-TD68-630 Weight 0.019 lbs. 1 µF C-T1-630 Diameter 0.75 in. 1 µF C-T1-630 Item Length 1.18 in. 1 µF C-T1-630 Packaging Dimensions 4 in. x 0.4 in. x 0.4 in. 1 µF C-T1-630 Weight 0.022 lbs. 1.5 µF C-T1D5-630 Diameter 0.91 in. 1.5 µF C-T1D5-630 Item Length 1.2 in. 1.5 µF C-T1D5-630 Packaging Dimensions 4.5 in. x 0.7 in. x 0.7 in. 1.5 µF C-T1D5-630 Weight 0.019 lbs. I needed some .5uF 600V caps for replacement in Supreme 504-A tube testers and these .47uF 630V capacitors did the job. This was exactly what I needed and the radio works like brand new. Great capacitors. I use these frequently in my antique radio restorations. They come in a wider range of values than other types. 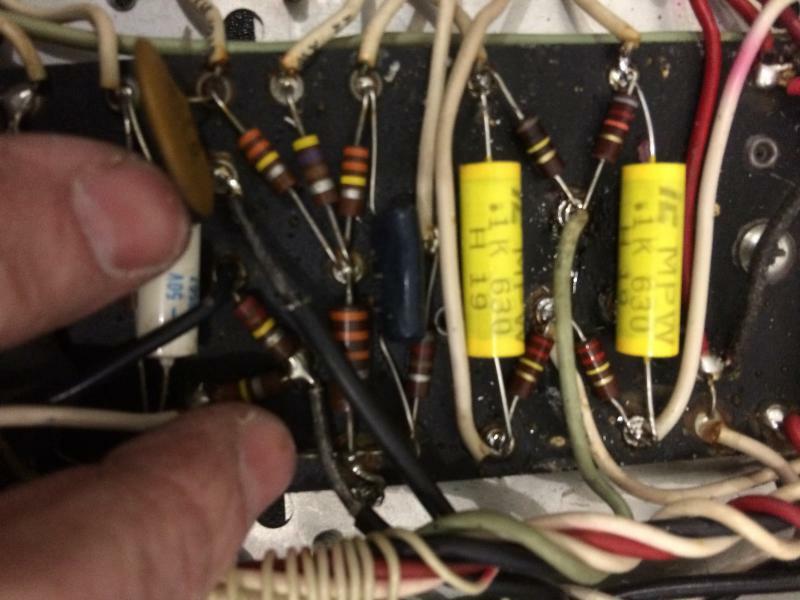 They are physically "bulkier" but this may be an advantage if you want to restuff capacitor tubes in antique radios as they are closer in size to original parts and the leads are both thicker and longer than most other poly caps. Have yet to see one fail. 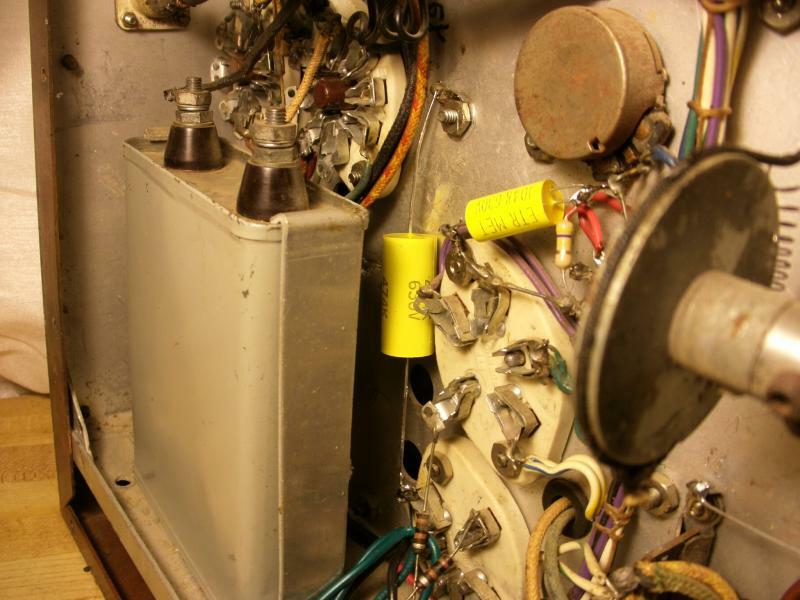 rehabbed rusty old Atwater Kent model 42.Heated power supply in oven,use wallboard screws threaded into capacitor assembly to extract from sticky goo.Be careful not to damage audio choke placed next to capacitor assembly. Next used tiepoints and Sprague electrolytics from TubesNMore mounted on piece of sheetmetal to replace potted factory capacitor assembly. Used metal film capacitors to retrofit bypass caps on radio chassis. Radio works great. probably better than in 1928. Have used Sprague electrolytics and Orange drops for 40 years and no problems. Glad they are still available. Rewired and recapped a 1941 Emerson GA439 AM radio. Bought all caps here. Radio sounds good now. Very well made, exact specifications. 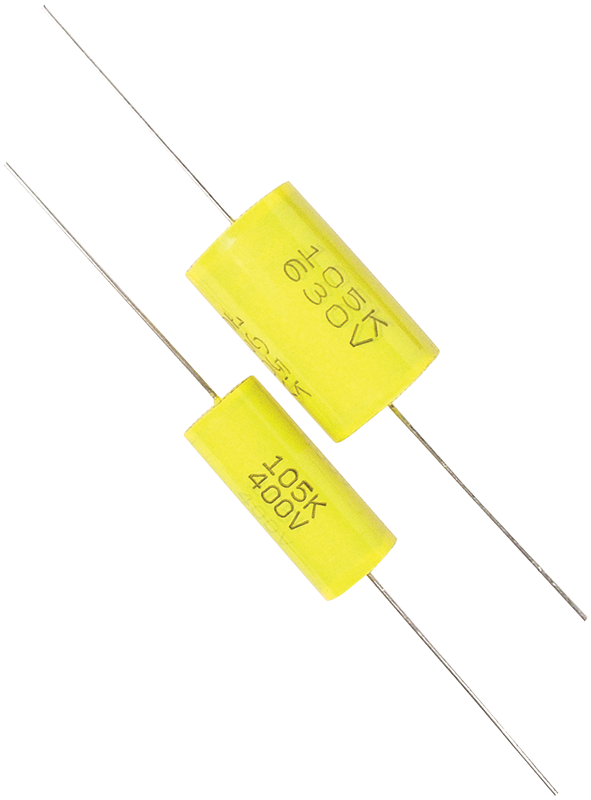 I've used these capacitors in many circuits and devices, everything from older TV and radio sets to much newer amateur radio equipment. They have performed very well, with no failures whatsoever. A good product at a nice price. These are awesome, performance and look of the famed Mallory's but with a fraction of the cost. Excellent product. Asked by Anonymous on May 4th, 2016. No this is a metal film capacitor. No, these capacitors are not made in China. Asked by biglongpontiac on January 8th, 2017. These caps are made in Taiwan. Asked by Anonymous on February 6th, 2018. It depends on the value. Check the product measurements above. Asked by Anonymous on February 8th, 2018. They function the same but are made of different materials. Asked by Anonymous on January 17th, 2019. That is not specified by the manufacturer. They only state that these are "metal film."